Elegant 60m² top-floor apartment with one bedroom, an additional high-quality sofa bed and a bathroom, welcomes you under authentic roof shapes. Private entrance with stairs up to the landing. Designed for your comfort, the high-quality sofa bed can host up to two guests in the living room for families, friends needing extra space. Smart decoration in black and white contemporary, the living room has a cosy ambience with top roof high ceilings. Specially designed and equipped for your comfort, the living room has everything you need to feel at home – and will charm you with its wooden parquet floors, designed pendant lights and soft rugs. 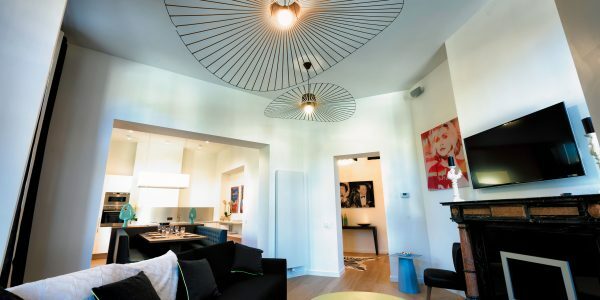 The flat also combines technology with comfort thanks to a high speed wireless internet access, a fully-equipped living room with sofa bed, additional seating, cabled flat-screen television / Bose Hi-fi speakers and a cosy original decorative fireplace. Furnished and fully-equipped, the separate kitchen has numerous cupboards for storage, dishwasher, washing machine and spin-dryer. The bedroom benefits from good natural light coming from skylights. It has a queen size bed, wide wardrobes with hanging space, flat-screen TV and a designed cubical bathroom with an Italian shower and toilets. The two facades of this three-storey corner building are connected by an elegant turret. Designed by architect Emile Janlet in 1894, it blends in perfectly with the eclectic style of the neighborhood and offers a stunning view of Ambiorix Square. Located on the corner of two beautiful avenues with only a stone throw away from EU Institutions and in the heart of the art deco residential area surrounded by parks with fountains, local restaurants – the apartment is easily accessible by public transportation with direct links to the airport, train station, historical center and shopping areas. The building Palmerston gives you access to European capital’s most emblematic sights while making yourself at Charles’ Home. Bright & Design One-Bedroom Apartment with Separate Kitchen – In the heart of Brussels’ European District Bright and design 65m² .. 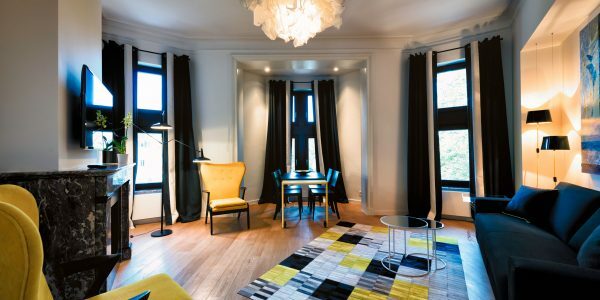 Contemporary One-Bedroom Apartment: – located in the heart of Brussels EU District Contemporary 85m² apartment with one bedroom, an additional ..